Have you ever brushed your hand up against a dimmer switch and noticed that some of them get extremely hot? I’ve done this many times while inspecting houses, and whenever I do, I look in to the reason for the heat. Occasionally I find an overloaded dimmer switch. That’s a fire hazard. To figure out if a dimmer switch is overloaded, you can add up the wattage of the lights that are being controlled, and compare that to the rating on the dimmer switch. The majority of dimmer switches are rated for 600 watts – this rating can be found right on the front of the dimmer switch, underneath the cover plate. In the photo above, you’ll see the 600 watt rating, as well as 500 and 400 watt ratings. When two of these dimmer switches are installed right next to each other, the little metal tabs will need to be broken off on one side of each dimmer, and the total allowable wattage gets reduced, or ‘derated’. In the photo below, the tabs are removed on one side of each of the dimmers, derating the maximum allowable wattage on each to 500 watts. 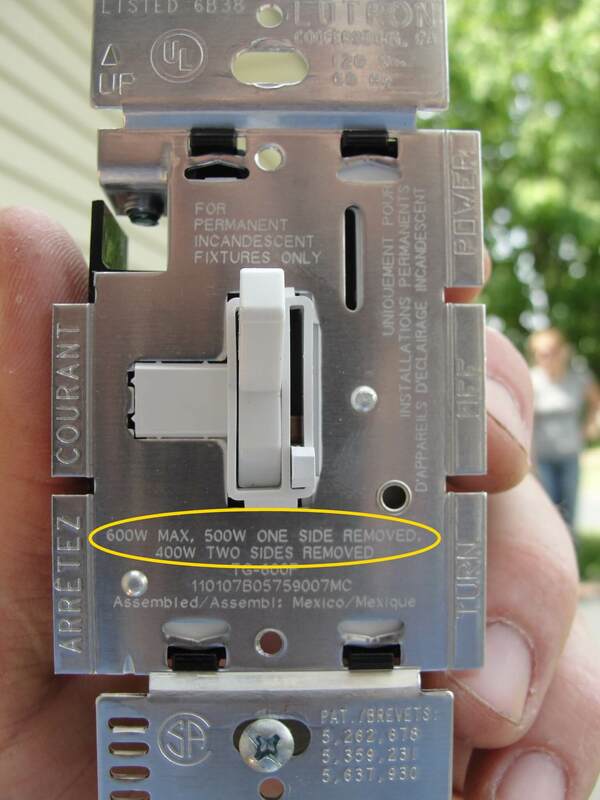 When more wattage is needed, special dimmer switches rated for higher wattages can be installed – for instance, Lutron sells a line of dimmer switches that are rated for 1000 watts each, and these dimmer switches don’t take up any more room in an electrical box than a standard 600 watt dimmer switch. While this is a lot of wattage, it’s not all that uncommon. I’ve actually come across several twelve-light chandeliers that take 60-watts bulbs; 720 watts for a single fixture. So, getting back to the temperature thing – if you put your hand against a cover plate and it feels hot, is this a problem? I started thinking more about this while inspecting a house in Plymouth the other day, after finding eight 65-watt bulbs controlled by a dimmer switch that was installed right next to another dimmer switch – it was the one pictured above. In other words, the dimmer was controlling 520 watts, but was only rated 500 watts. I noticed that the cover plate was very hot, so I pulled out one of the cover plate screws and stuck my thermometer in to the hole – it was 145 degrees. Out of curiosity, I set up a little experiment to get a better idea of how overloading a dimmer switch would affect it’s temperature. It should go without saying, but I’ll say it anyway – Don’t try this at home. You could set your house on fire, get electrocuted, or your wife might wonder why you’re doing some dumb experiment instead of helping with the yard work. Don’t ask how I know. I installed a 600 watt dimmer switch in a single gang, 18 cubic inch box, and ran some lights off it. Of course, there are plenty of variables that aren’t being factored in to this little experiment, such as the box not being installed inside a wall, no cover plate installed, etc… but this was good enough for me to make a few comparisons, which is really all I was after. 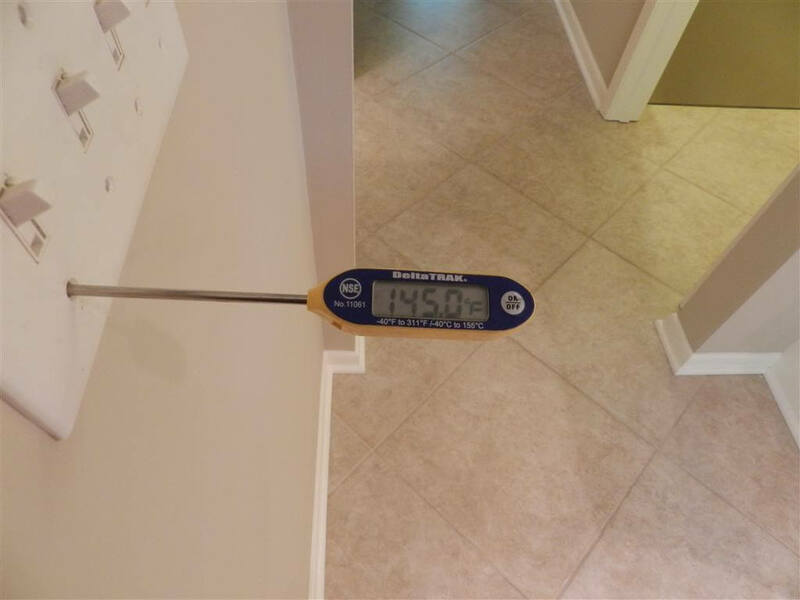 I turned the dimmer switch on to full brightness, and measured the temperatures by sticking my thermometer in to a cover plate screw hole; this seemed like a good way to get consistent temperatures. 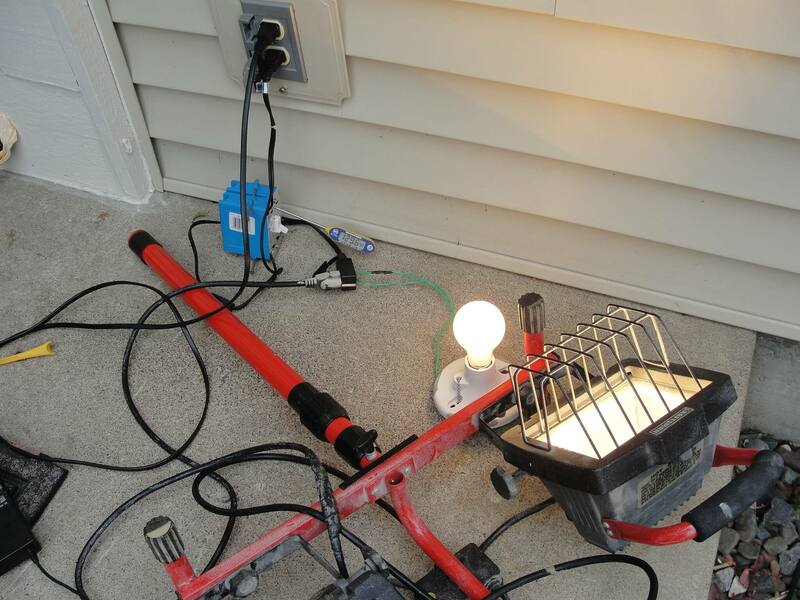 With a 600 watt dimmer running a full 600 watts of lights, the temperature got up to 135 degrees. At 750 watts, the dimmer switch got up to 158 degrees. Next, I tested a 1000 watt dimmer with a full 1000 watts. This was the part that made me smile – the temperature went up to exactly 135 degrees. Conclusion: A properly installed, fully loaded dimmer switch will get quite hot to the touch. This isn’t necessarily a problem, but when dimmer switches get hot, it’s worth checking the rating of the dimmer switch and the wattage going through the dimmer to help make sure the dimmer switch isn’t overloaded. By the way, this post is focused on ‘new’ dimmer switches, which get hot with lights at their brightest setting. Older dimmer switches did the opposite – they would get hottest with the lights at their dimmest setting. 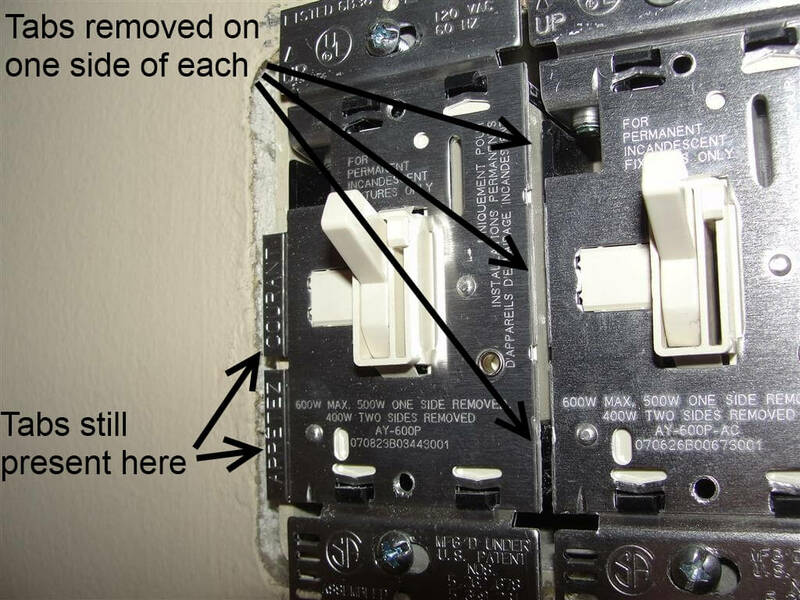 You can read all about how the two different types work at HowStuffWorks – Dimmer Switches.